Secretary of State Kim Wyman has released the initial candidate list for Washington’s 2016 Presidential Primary, including five Republicans and two Democrats. Wednesday was the deadline for the Secretary to make the declaration, confined by state law to those “generally advocated or whose candidacy is generally recognized in the national news media.” The final list, updated with any withdrawals or candidates who qualify by submitting voter petitions, will be certified and provided to the counties by March 18. The initial list includes Republicans Ben Carson, Ted Cruz, John Kasich, Marco Rubio and Donald Trump. Democrats are Hillary Clinton and Bernie Sanders. 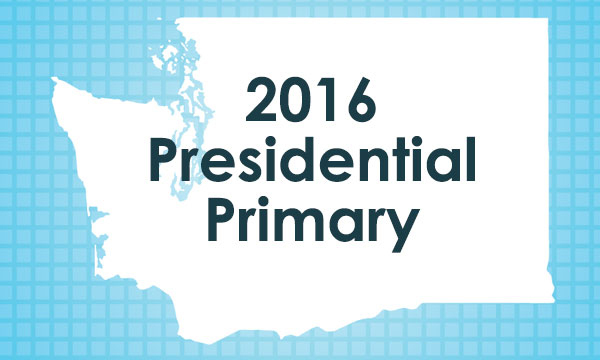 The Presidential Primary voting period ends on May 24. Ballots must go out to military and overseas voters by April 9, and regular ballots and Voters’ Pamphlets will be delivered the first week in May. Republican and Democratic presidential candidates who were not on the Secretary’s preliminary list are permitted to circulate petitions. It takes at least 1,000 valid signatures of registered Washington voters to make the ballot this way. April 25 is the last day to register by mail or online, or to update one’s address or name. Those not currently registered in Washington may register in person at the county elections offices until May 16. The Presidential Primary was created in 1989 as a citizen Initiative to the Legislature. It was run in 1992, 1996, 2000 and 2008. Unlike all other Washington elections, Presidential Primary voters are required by law to declare a party for the primary they’re voting in. The declarations, written by the Democratic and Republican parties, are located on the return envelope. Without a signature and checking the appropriate party box, the vote will not be counted. Voters will receive a unified ballot with both party primary lists, but voters can only choose a candidate within the party they declared. The parties will receive a list of voters who chose their ballot, but the actual candidate selection by the voter is kept confidential. The lists are public record for 22 months. Republicans will use the primary results to allocate their national convention delegates; Democrats will not. The Democrats will use their March 26 caucuses and subsequent conventions/caucuses to allocate national convention delegates. Secretary Wyman attempted to move the primary date to March 8, but the primary date-selection committee deadlocked on a party-line vote, with Democrats objecting to the earlier date. The default date set by the original Presidential Primary initiative is the fourth Tuesday in May, this year May 24. The funding was included in the state budget adopted by both houses and both parties, and signed by the Governor.